With the defeat of Licinius, Constantine was left as the sole leader of the entire Roman world. But that didn’t stop him from dreaming. In one dream he saw the spirit of the city of Byzantium as a tired and frail old matron. But then she was transformed before his eyes into a beautiful young woman and with his own hands he adorned her with the accoutrements of an imperial city. God clearly knew a good location when he saw one. Constantinople is built on a triangle of land that juts out into the Bosphorus where it comes near to Asia Minor commanding the end of the narrow straits that link the Black Sea with the Sea of Marmara. The natural harbour formed by the northern side was of enormous value. It could be used for both military and commercial purposes. Any attempt to attack by land would have to reckon with the probability that the city could be supplied from the sea. A sea born attack would be easy to defeat because the narrow entrance to the bay could easily be blocked by drawing a chain across it. The surrounding land was fertile and well tended which would be useful in the feeding of a large population. The fish in the locality are abundant and easily caught, another bonus. And in addition to its highly beneficial local advantages, it also occupied a key strategic position. During the crisis of the third century the goths had been able to sail across the Black Sea, through the narrow straits of the Bosphorus past Byzantium. From there they had got into the Mediterranean where they had been able to reach most of the empire with ease. The foundation of Constantinople blocked off this possibility. So the building of a new city made religious sense, and its geography made it easy to defend. It was also a great location strategically. It allowed easy communication with the always troublesome Danube frontier and was close to the sensitive border with the Persians. What more could an emperor wish for? Well when the emperor is Constantine, quite a bit. Since it was to have his name it needed to be a city on a scale that reflected his ambition. The size of the plot was just the start. The new Rome had to not just rival, but to eclipse the old one. In everything. One of the symptoms of the decline in the empire was the shortage of educated people with skills. In order to bring his city to the state he wanted it Constantine had to found new schools of architecture to supply the men he needed to fulfill his vision. When Constantine wanted something, he put every conceivable effort into it. Architects can be trained. Artists have to be born. There was no way to create a cadre of imaginative painters and sculptors to decorate the new city suitably. Instead Constantine brought existing artworks from the rest of the empire, especially statues. A good example was a bronze statue of Apollo moved to the new capital from a city in Phyrgia, or possibly from Athens. The sculpture was reputed to be Phidias. Phidias was the most famous sculptor of the ancient world, even having one of the wonders of the world on his CV, so to have one of his works in Constantinople was an ornament indeed. The statue had been cast in bronze, a scepter in one hand, a globe in the other and a crowned with rays of light. This would later be reinterpreted as a statue of Constantine himself. It was placed on a 100ft marble column in the forum. The statue is now long gone, but the column still stands in the ruins. It is known as the Burnt Column. Any new city would have a forum, that was a foregone conclusion. That Constantine would make that forum large enough to rival he one in Rome made clear his intentions for the role he foresaw for it. And there were no pagan temples. Instead it was from day one a city that worshiped the one true God. So there were to be plenty of churches. The main one, and the one that Constantine no doubt envisaged as the main church of the empire and of the religion of Christianity as a whole was Santa Sofia: the church of the holy wisdom. I suspect if Constantine could be resurrected today he would be quite surprised to find that St Peters in Rome is the premier centre of Christianity according to the majority of Christians. It isn’t often remembered that there was a religious aspect to gladiatorial games, so in keeping with his desire to make a new start without pagan influences, rather than supply the new city with an arena for games he instead built a hippodrome dedicated to chariot racing. This was to become very popular with the inhabitants. A new senate was created and people were invited from all over the empire to the new city. At first Constantine had to offer specific inducements, but the attractions of the place were soon strong enough for it to become a magnet drawing in the declining population of the empire. Let’s be clear here. Constantine was playing a zero sum game. The empire was well armed and effectively defended, but it was not expanding. The sole energy source was muscle power and at this time in history muscles could only be available if they were fed by farming. If there was any technological progress at all it wasn’t significant enough to create a fourth century green revolution. 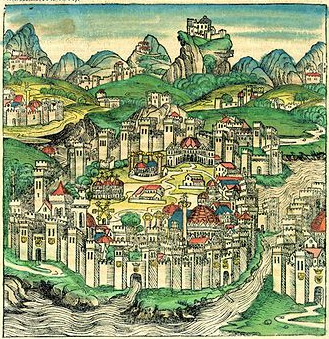 As the population of Constantinople grew it inevitably drew resources from other cities. And grow it did. It was soon to become the biggest city in the empire, and possibly the biggest in the world. Even in Constantine’s time the population must have got over 100,000. That is a lot of dinners. The city was fed by a number of means, one of which was a corn levy from the rich province of Egypt. This was a simple enough operation logistically. The Egyptians grew corn and the Romans took it off them and gave it away to the populace of the new city. One can see how that made becoming a citizen of the new metropolis appealing. The Egyptians probably saw the downside of the arrangement a bit more clearly. Egypt was not the only province to suffer from the robust approach Constantine adopted towards getting the resources he needed. Constantinople was a huge project in itself, and on top of that there was the maintaining of a huge military machine and a huge programme of church building. Non productive fighters and prayers have to be supported by the rest of society. This means taxes. And again it was a zero sum game. More soldiers meant less for everyone else. Socialism has been described as ‘from each according to his means, to each according to his needs’. To describe the Roman Empire under Constantine and his successors you only need the first half of that phrase. The objective was simple enough. Squeeze as much out of the population to support the palace, the Church and the military. The tax was collected in kind and gold every four years. Debased imperial coins were not accepted as payment of imperial taxes. Collection was efficient and effective. A full census was carried out every 15 years – no trivial matter in such a large empire and without paper on which to record it. Gibbon would not be surprised by modern archeological data showing that standards of nutrition rose after the fall of the empire in the West. Taxes were collected indiscriminately and with no regard to encouraging trade or development. The full coercive powers of the state were brought to bear on taxpayers up to and including torture. This had a generally depressing effect on economic activity. A survey of an Italian province carried out some 60 years after the death of Constantine revealed that one eighth of cultivated land was abandoned. This is not surprising when you consider the plight of the Decurions. Being a decurion had originally been a mark of esteem. They were the wealthy local businessmen and landholders who played a leading role in the small town community life. But under Diocletian they had been given the unpaid role of tax collectors and enforcers. They had to make up any shortfall out of their own pockets. This could and did ruin them. But they were not allowed to give up the post, and could be executed if they tried. It was a tax and spend regime that took both taxing and spending to extremes, but which did at least balance the books. In a world of profligate state spending on credit this probably seems more virtuous in hindsight than it deserves to. The wreckage of the currency that previous emperors had achieved had wrecked the financial system removing the option of borrowing to fund big projects. The financial institutions simply weren’t there. So if the emperor wanted to build a city, the resources had to be found there and then. It could not be spread over a few generations. Undoubtedly the burden of taxation led more and more people to give up the struggle for financial independence and to throw in their lot with anybody who offered them the chance to survive in return for giving up their liberty. The gritty independent farmers who had founded a republic and fought to defend and then extend it were long gone. Only the outward form of some republican institutions and attitudes remained. But even these were being hacked away. Where Augustus was careful to portray himself as simply another citizen, Constantine was appointed by God. His titles would have shocked a Roman from an earlier era. Titles being thrown around included your sincerity, your gravity, your sublime and wonderful magnitude, your excellency. Admittedly that last one probably didn’t sound as ridiculous then as it does since the release of the film of Bill and Ted’s Excellent Adventure. It is hard to imagine what a hard bitten consul of the old republic would have made of it. It was a far cry from Augustus styling himself Princeps to disguise his true power. The consuls did still exist, even though Diocletian had abolished voting for them. They were now in the gift of the emperor. Empty titles are a great boon to autocrats. It is a great way to reward people that involves giving them neither power nor money. So it is no surprise seeing Constantine reviving the long lapsed order of patricians. The patricians of the republic had been a true aristocracy that you had to be born into. Constantine’s version was a bit different. He appointed patricians and you couldn’t pass the role on to your descendants. But there are always enough people around for whom a flashy title is as good as, indeed better than a real role with real responsibility. The civil administration was handled by 4 praetorian prefects in areas corresponding to the old tetrarchy. They no longer had any military function so they posed no threat to the emperor. They concentrated on justice and managing taxation. Rome and Constantinople were exempt from their jurisdiction, they each had praetor who maintained order. Governors still existed and still had some kind of role. They also administered justice in their particular provinces and were able to impose punishments up to and including execution. They weren’t allowed to impose large fines though. Those went directly to the emperor. He was heedless of his subject’s lives, but he was very interested in what happened to their money. Having more than one system for administering the law certainly sounds like a recipe for confusion and no doubt it was. Lawyers continued to thrive. I sometimes have the feeling that if an asteroid hit the earth wiping out all forms of life except cockroaches there would still be lawyers around. The military were also reorganised once again with the emphasis on making a challenge to the authority of the emperor difficult to pull off. The most notable example of that was the reduction in the size of the legion to half the size it used to be. Commanding a legion was no longer anywhere near such an influential post. But you did get to wear a special gold belt. Status and titles were once again used as handy substitutes for power. A couple of military titles started to become prominent at this time – counts and dukes. These were to go on and become aristocratic titles in the world after the empire, but for now they were simply ranks in the army. There were also two grades of soldier, internal and external. The external ones were the guys actually manning the frontier dealing with threats from outside the borders. The role of the internal ones wasn’t spelled out but it is pretty likely that they were intended to keep the population under control. The manpower requirements were very large and this sucked in even more Germans into the empire where they were able to observe with their own eyes just how the whole system worked. If the army was now huge, so was the court. Another contribution to the tax burden. But the state was not just a drain on the economy, it also became an active participant in it. The army was supplied by state run factories. Thirty four different cities had centrally controlled armouries in them supplying the troops with weapons and equipment. It was very much like the Soviet Union in many ways. This included the problem of all non-privately owned enterprises of ensuring quality and innovation. Archeologists have found that steel forged in barbarian Germany at this period was of superior quality to that from the empire. The court projected the power of the emperor directly to his subjects. Messengers were sent out with proclamations and edicts. They also reported back on what was going on in the provinces and soon to on the role of making sure that the edicts were being obeyed as well. The employed spies and informers so in keeping with the Soviet Union comparison, we have a secret police as well. They were empowered to use torture in their investigations, so coming under suspicion was bad enough even if you didn’t feel guilty. But there were some restraints on their powers. There were categories of citizen that were exempt from torture. These were people of an illustrious or honourable rank, bishops and their presbyters, professors of the liberal arts, soldiers, municipal officers, and children below the age of puberty. It is pretty clear where the regime felt its support lay. But just to be on the safe side, none of these exemptions applied in the case of an investigation of treason against the emperor. The court itself was large and well staffed and probably amounted to many thousands of individuals in the palace itself and representatives elsewhere in the empire. Much like the army, much of the court’s consumption was self generated. The treasurer general employed a large staff to count and manage all the money extracted from the population. But he we also in charge of all the mines where the precious metals were extracted. And he also ran large factories manned by slaves producing linen for the use of the imperial household. Constantine has been praised by many people for his promotion of Christianity. He has also been criticized for much the same reason. As we have seen, he was certainly a ruthless autocrat determined to get what he wanted and capable of any amount of repression to achieve it. Personally I regard him as an ancient version of Stalin. But like Stalin, not everything he did was bad. And the foundation of Constantinople was to prove far sighted. The city proved to be a major asset to the empire for centuries to come. Towards the end, it would be just about its only asset. The city is to be the major character in the story we are going to tell from now on. It will become the central focus of the politics of the empire and for the next eleven hundred years it will be central to history. The strong walls of this great Christian city will protect the empire from disaster more than once. And in all probability they protected Christianity itself from being overrun. If he had done nothing else, the foundation of Constantinople would be enough to earn Constantine the title he is often awarded of Constantine the Great. Lots of people who write about ancient history toss around the phrase “King X founded a city at Z” casually, without giving any hint of the massive undertaking that must have involved. I enjoyed hearing some detail to bring the process alive. May an ignorant colonial request a translation from the English? When a British historian refers to “a levy of corn from Egypt”, what does “corn” mean? I don't imagine Constantine was making tortillas for his subjects…. Thanks for the kind comments Calvus, and the comment about corn applies both sides of the Atlantic. In Gibbon's time wheat and corn meant much the same thing. I think this only changed over here when we started eating cornflakes for breakfast when referring to wheat as corn started getting confusing. Strictly speaking the stuff the Mexicans make their tortillas out of is maize, but it also gets called corn quite often. People still make little toys out of wheat straw called corn dollies, so referring to wheat as corn hasn't entirely died out yet.